Your hearing is individual to you and you will have your own preference when it comes to hearing aids. With over a thousand different types of digital hearing aids currently on the market, choosing the right hearing aid can be a daunting process. Visiting a good audiologist will make the process simple and straightforward. Buying the latest hearing aid technology from a world leading manufacturer should be an exiting and pleasant experience. Make sure to go somewhere completely independent i.e they have no tie-in to any manufacturer. Hearing aids should be tailored to fit your individual needs perfectly. This is more likely to happen from an impartial supplier due to the wider choice of devices. All the high street chains such as Amplifon, Boots Hearing Care, Bloom, Hidden Hearing and Specsavers Hearing Centres have tied contracts with different manufacturers. A good independent should be proud of being able to offer every hearing aid available and give you the most suitable solution for your requirements. The best way to find the best local independent hearing aid shop is to simply search on Google Maps and see which one has the best reviews. Then go and try the hearing aids for yourself! A free digital hearing aid demonstration and 30 day trial should be part of your free hearing assessment. There should be a returns policy if you are not completely satisfied even after purchasing. At The Hearing Lab, we have access to the latest, high performance hearing aid technology from the world’s leading manufacturers. There are more than a thousand digital hearing aids on the market in a variety of different styles, sizes and colours. We tailor each hearing aid solution to meet your specific needs. The most important factors in determining the hearing aid that is right for you are; your hearing test results, your style preference, your lifestyle and your dexterity. Our prices are not determined by the size of the hearing aid but instead by the features within it. This means that we can find a solution that not only suits your needs but also suits your budget too. Many hearing aid users are self-conscious about the visibility of their hearing aids. At The Hearing Lab, we are specialists in providing the latest invisible hearing aid technology. Invisible hearing aids (also known as invisible in canal- IIC) are very small, custom-made devices that are designed to fit deep inside your ear canal so that no hearing aid is visible from the outside. Without losing focus on providing the best hearing care possible, these devices also contain the very latest in sound technology to give unsurpassed levels of richness and clarity. The IIC is the smallest custom hearing aid available on the market. Due to great developments in technology, they are now a lot more powerful than their small size initially suggests. This means that they are suitable for a greater range of hearing losses. Before the invention of the invisible-in-canal (IIC) hearing aids, the CIC was the smallest custom made digital hearing aid available on the market. The CIC is moulded to fit deeply inside your ear canal and is therefore very discreet and almost invisible. The advantage of the CIC over the IIC is that some manufacturers are able to offer CICs with wireless functionality. Still relatively small and discreet, the ITC fills the lower part of your external ear. Some clients may prefer this style of hearing aid as it not only meets the requirements of being cosmetically pleasing, but is simple to use as the slightly larger size is easier to handle and control. ITC hearing aids are available with dual microphones to help improve understanding of speech in noise. All manufacturers are able to provide this type of hearing aid with wireless technology and telecoil functionality due to its slightly larger size. The in-the-ear (ITE) hearing aid is available in both half and full shell size, filling either half or all of the external ear respectively. Although these hearing aids are visible in the ear, they provide a custom made solution that has the advantage of being easier to handle than smaller custom made devices. The ITE is the best custom option for someone who requires a powerful hearing aid but has limited dexterity or poor vision. Also known as the Remote Mic. (RM), this style of hearing aid is exclusive to one particular manufacturer, GN Resound. A revolutionary and innovative custom hearing aid design, the MIH hearing aid is smaller and more powerful than the conventional, custom made products. The MIH design is unique because the microphone is placed at the end of a flexible tube that is placed securely in the ‘concha symba’ of the pinna. The rest of the hearing aid is inserted in to the ear canal, like a conventional CIC (completely-in-canal) hearing aid. The position of the microphone helps to preserve the natural acoustics provided by the external part of the ear, giving the hearing aid user a much better sound experience. With MIH hearing aids, the sound benefits over other conventional custom hearing aids include; better natural directionality, better wind noise protection and better natural sound localization. The receiver in canal (RIC) hearing aid, also known as receiver-in-ear (RIE) and receiver-in-the-ear (RITE) is a very discreet, yet powerful hearing aid that sits comfortably and discreetly behind your ear. The hearing aid is attached to a very thin tube with an electric cable running through it. This cable then delivers sounds directly in to your ear via the receiver (which is the loudspeaker part of the hearing aid). With the hearing aid receiver in the ear, it sits closer to the ear drum than any other system, meaning it requires less volume to provide you with the same level of performance. This not only decreases any likelihood of distortion, it also increases the level of clarity. The RIC hearing aid also leaves the ear canal open, which as well as making it comfortable, allows external sounds to go in to your ear naturally making the most out of your remaining natural hearing. Thanks to huge developments in technology, the RIC hearing aids provide suitable amplification for a variety of hearing losses. With a fitting range capable of extending from a mild hearing loss to a moderate or even severe loss, the RIC hearing aid is definitely one of the most adaptable hearing aids available on the market. The Behind the Ear (BTE) hearing aid fits snugly, behind the ear and is attached to a custom earpiece. This style of hearing aid is very popular amongst hearing aid wearers and is by far the most widely used style of hearing aid in the UK. 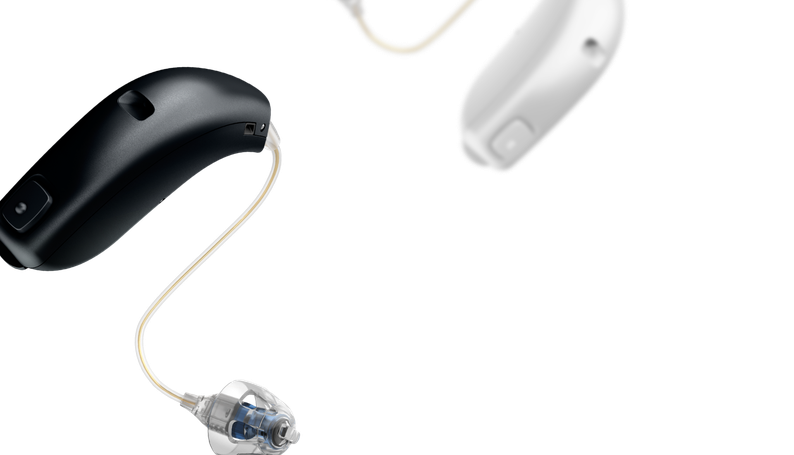 These hearing aids are the preferred digital system where power and additional features such as wireless and telecoil functionality are a consideration. The BTE hearing aid can be categorized in to two sub- styles; the receiver-in-canal (RIC) and the standard BTE hearing aid.